How Much Does it Cost To Fly To Honolulu? The cheapest flights to Honolulu found within the past 7 days were $325. Prices and availability subject to change. Additional terms may apply. Now that you’ve bought your plane tickets to Hawaii, welcome to Honolulu - a gem of a city on the island of Oahu! Hawaii's capital and center of activity, Honolulu has it all, from an incredible culinary scene to pristine beaches. You can get away and enjoy nature one moment and take advantage of all the amenities the dynamic downtown area has to offer the next. This is the type of place you won't want to leave, so check out the rates on Honolulu flights to find the best deals on cheap Hawaii plane tickets. Regardless of whether you land at Honolulu International Airport (HNL) in December or July, you're sure to love it here. Most Honolulu hotels by HNL Airport offer free shuttle service, but if you stay downtown, by Pearl Harbor, near Diamond Head crater, or another popular spot, your options for getting there include shuttle service, taxi service, or private car. Car rental companies are conveniently located within the airport terminal, but you'll want to make a reservation to be sure to have car waiting for you. The Interstate is located close to the airport with exit ramps that make getting to your desired location a breeze. You can expect the amenities in the hotels to be top-notch, and they will make a great place to relax and refresh before you hit the beach. For the best deal on hotel rates, make your reservation when you book your plane tickets to Hawaii. Explore Chinatown, check out Waikiki Aquarium, and tour the Bishop Museum, where you can see Hawaiian artifacts. There is a lot to see and do here, including visits to volcanoes. It's no wonder flights to Honolulu are a hot commodity. Don't forget to set some time aside for a traditional luau and for just relaxing on the beach. No matter what plans you have after booking plane tickets to Hawaii, Travelocity can help with Honolulu vacation packages that will save you up to $537 on your next trip. Book Hawaii plane tickets today to get the best deals. Question : Where can I find cheap flights to Honolulu? Answer : We know you’re looking for the best flights at the lowest fares, so we found some of the sweetest deals in town just for you. 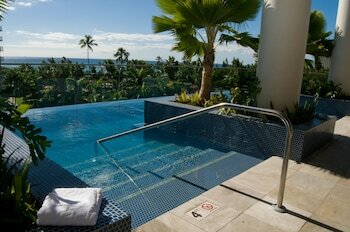 Check out the top flight deals to Honolulu. Act quickly and score yourself a bargain! Alaska Airlines has a flight from to Honolulu departing on 5/7/19 and returning on 5/11/19 all for only $376.00 per person. * Book these Alaska Airlines flights! United has a flight from to Honolulu departing on 4/30/19 and returning on 5/4/19 all for only $380.00 per person. * Book these United flights! American Airlines has a flight from to Honolulu departing on 5/3/19 and returning on 5/7/19 all for only $383.00 per person. * Book these American Airlines flights! Question : What are the most popular airlines that fly to Honolulu? American Airlines Flies 186 flights per week between and Honolulu. United Airlines Flies 176 flights per week between and Honolulu. Hawaiian Airlines Flies 158 flights per week between and Honolulu. 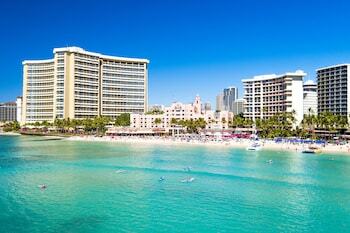 Question : Which hotels are located near airports or major attractions in Honolulu? 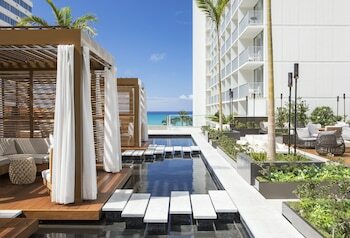 Answer : We've put together a list of hotels in Honolulu close to airports and popular sights to see. Check out the hotels below. 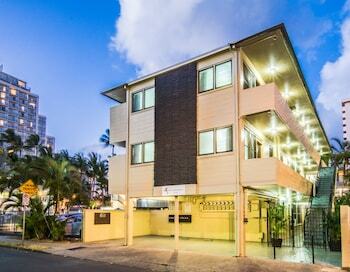 All of them are within proximity to must-see attractions and major airports in and around the city of Honolulu. 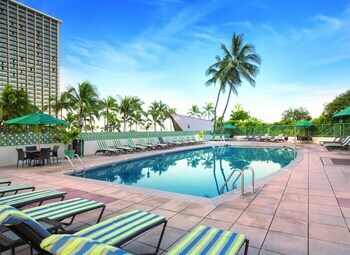 Outrigger Waikiki Beach Resort: Located in the middle of Waikiki, this beachfront Outrigger hotel is close to water sports, shops, and restaurants, and a short walk from a zoo, aquarium, and park. This hotel has a 4.00 star rating. Hilton Waikiki Beach: Just a block from the sand, surrounded by fine dining and boutique shopping, is the Hilton Waikiki Beach. It's 4 miles (6.4 km) from downtown Honolulu, and a 20-minute cab ride from the airport. It's a 30-minute bus ride to the memorials of Pearl Harbor, This hotel has a 4.00 star rating. Hilton Hawaiian Village Waikiki Beach Resort: With lush gardens, ponds, and waterfalls, this 22-acre Honolulu destination resort is fronted by several acres of Waikiki Beach; offers views of iconic Diamond Head Crater; a weekly Polynesian extravaganza includes traditional dance and fireworks. This hotel has a 4.00 star rating. Outrigger Reef Waikiki Beach Resort: Located on Waikiki Beach, this popular, renovated Honolulu hotel features an island-style environment and is surrounded by Waikiki restaurants and shops. The hotel itself offers a variety of dining temptations. This hotel has a 4.00 star rating. Question : What are the top attractions in Honolulu? Answer : Honolulu has over 37 points of interest for you to choose from. We suggest checking out Diamond Head and Hawaii Convention Center first because they are the most popular attractions in Honolulu. Don't forget about other highly recommended spots like University of Hawaii at Manoa, USS Arizona Memorial, and Aloha Tower Marketplace. Get out there and see what the city has to offer on your trip to Honolulu! We had oceanview and it was spectacular. The room was good sized and housekeeping place everything in neat piles that we left out.